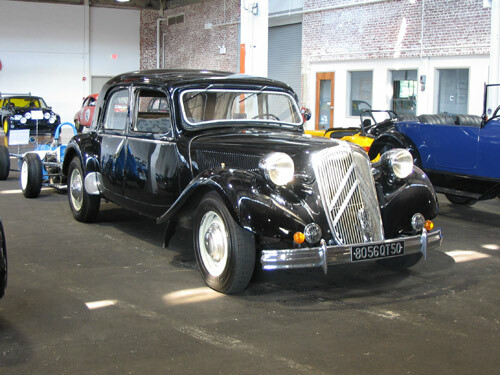 When Citroën introduced the “Traction Avant” (means front drive) in 1938, it was a radically different concept from the cars Citroën had been producing. Most cars were still built with a wooden structure covered with metal parts and fixed to a chassis, with the engine bolted on directly, wheels mounted on stiff axles, and brakes operated by cables or rods. André Citroën created the modern volume production car as it is built today. 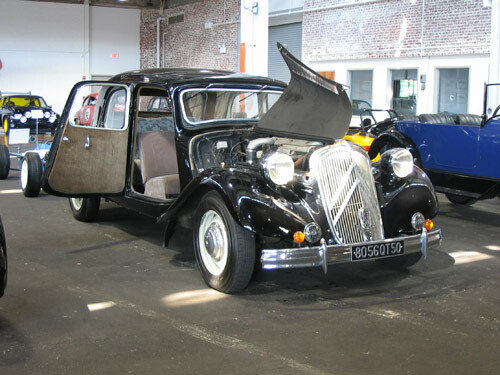 In addition to its front drive wheels, the “Traction Avant” has an all steel monocoque body, an engine mounted on a silentbloc and independent front and rear suspension. It is designed to take into account the distribution of weight and the flow of air around and under the body. This car was produced until 1940; post war production restarted in 1946. The style of the post war model did not change from the pre-war style. It was only available in black until 1953 when grey or blue was offered.